My precious Pokemon was stolen! Woman「Oh,thank goodness,you can understand me! I can follow some of the language here,but I can't speak a word! My precious Pokemon was stolen from me at the station. I heard that this place is a detective agency,so I rushed right over! Please find my beloved Pokemon and get it back for me immediately! Woman「I'm sorry to be so abrupt. But I'm in a terrible hurry! I can't return to my home country without my darling Pokemon! Woman「What's wrong with that man?! He hasn't understood a single thing I've said! I didn't come here to drink tea and chat! I want my Pokemon back, NOW! Woman「What's wrong with this girl?! I'll bet she's the daughter of that useless detective,Handsome! Matiere「…Hey, old lady! Watch your mouth! but I won't let you insult Mr. Handsome! And I'm not his kid, I'll have you know. You're being very rude to him yourself. I naturally picked up some bits and pieces. Woman「Oh good. At least, there's someone who can understand me. Please forgive my hasty words earlier. I've been　in a panic. My darling Pokemon is more important to me than anything else in the world! Matiere「Hmm… Anything else? where was it stolen? Woman「At the town train station! 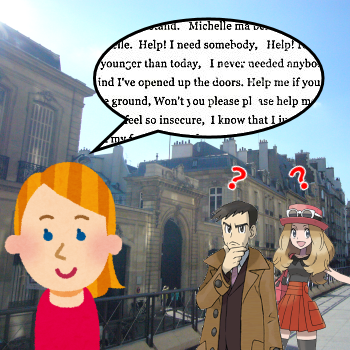 my Bag was gone– and my Poke Balls with it! Woman「Oh, please! You must help! 黄色い鼠とgameの書き処 © 2007-2019. All Rights Reserved.